For me, the British & Irish Cup was very helpful to Leinster's cause over the years, whether we were winning it or not. That said, I can see why it was far from ideal for most of the other teams involved, not to mention the AIL clubs back home. But the Celtic Cup which replaced it, despite having only 8 clubs involved, is certainly an upgrade. It means we can assemble a reserve squad for seven straight weeks in a competitive environment, and now as an international window winds down before a Champions Cup one opens, matches like tonight's against the Ospreys give us a chance to see what kind of talent has stepped up. I only got to see Leinster A's home matches on the way to lifting the cup, but for those occasions one name that stood out was Scott Penny. Clearly unfazed by the dearth of quality back rowers ahead of him, he seems to be one of those players who is determined to let you know he's there, whether it's finding the try line (particularly on the back of close range mauls), jackling turnovers or sometimes even copping a yellow card. We'll see how he handles the RDS atmosphere. Another youngling I look forward to seeing tonight is Conor O’Brien. He seems to be a strong 12 in the Henshaw mould and has had very bad luck with injury so needs matches like this one to finally show what he can do. While we're looking for Penny to finish tries off lineouts tonight, keep an eye out for Conor's crash ball talents on scrums in the Osprey 22. Not that those pesky birds are going to be an easy proposition by any stretch. They too might be missing internationals but this is still a decent matchday squad they're sending over, especially in their back three - Hanno Dirksen has shown some fine Pro 14 form of late and in Keelan Giles they have pace to burn. Let's just say that below-par territory kicks are likely to be punished. That said, we have punishers of our own…if ever a night was teed up for James Lowe to lead by example it's this one, and he strikes me as the kind of bloke who would be positively itching to get back on the pitch. 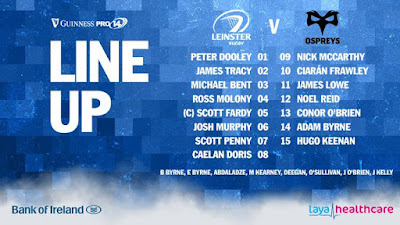 Next prospect up for scrutiny is Ciarán Frawley - with Ross Byrne more than deserving of his Carton House time, this represents a good chance for him, and he has a worthy opponent in Sam Davies, although word has it the O's are the league leaders in putting boot to ball so expect many bouts of aerial tennis. When it comes to looking for leadership tonight it has to be from the engine room… Scott Fardy is captain but his fellow lock Ross Molony has also worn the armband. If at the very least they can work with James Tracy ensure us good lineout ball on our own throw, we'll be very hard to beat. 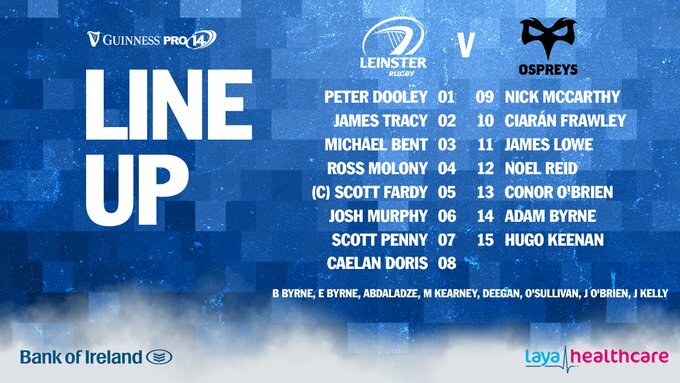 Much like my feelings ahead of our match against the Southern Kings, while I would be confident of a Leinster victory, my only worry would be our untried 10/12/13 combo defensively. If our guests stick with the high ball this won't be as much of an issue, but I can also see them getting big gains from the likes of Giles coming off his wing so the tackling will have to be tough. The bookies have us winning by 10 - with the feel good factor from last weekend still in force I think we can possibly beat that with a strong showing from a bench which is also full of youngsters, yet particularly in the forwards we hopefully have enough to see home a win by 12-14. REPLACEMENTS 16 Sam Parry 17 Gareth Thomas 18 Alex Jeffries 19 Rob McCusker 20 Will Jones 21 Matthew Aubrey 22 Luke Morgan 23 Tom Williams.